старший преподаватель кафедры финансов, менеджмента и администрирования Кировоградского института развития человека. Senior teacher of Department of finances, management and administration of Kirovograd Institute of Human Development. В статье исследована проблема профессиональной адаптации молодых менеджеров торговых организаций к профессиональной деятельности. Определены и охарактеризованы компетенции и дополнительные качества, которые не формируются образованием, а также те аспекты профессиональной адаптации, которым не уделяют должного внимания в высшем учебном заведении: «soft skills», коммуникативные компетенции, тайм-менеджмент, мета-навыки. Теоретически обоснованы ранее разработанные педагогические условия профессиональной адаптации менеджеров торговых организаций на основе анализа научной психолого-педагогической литературы и публикаций по менеджменту в соответствии с выделенными факторами, которые препятствуют профессиональной адаптации. Ключевые слова: профессиональная адаптация, менеджер торговой организации, способности, педагогические условия, методы обучения, профессиональные компетенции, интерактивное обучение, личностно-ориентированный подход. The article explores the problem of occupational adjustment of young managers of commercial organizations. With respect to this problem the crucial competencies and additional qualities of a manager were examined and the ones, neglected by higher education, were singled out. They are: soft skills, communicative competences, time-management skills, meta-skills. The article offers theoretical justification of educational conditions, developed at the earlier stage of research, in respect to their effectiveness for occupational adjustment of managers of commercial organizations. The theoretical justification is done according to the identified factors, interfering with the process of successful occupational adjustment. Keywords: occupational adjustment, manager of a commercial organization, skills, educational conditions, methods of instruction, professional competencies, interactive learning, personality-oriented education. The analysis of a modern labour market shows, that the system of traditional training of managers of commercial organizations doesn’t correspond to the requirements of their practical activities. We can’t but point out that the core knowledge and skills, acquired by specialists in the process of today's education, on the one hand, fall short of the new requirements and approaches. On the other hand, they become considerably outdated by the time the graduates start their career, especially in business. (A.P. Panfilova [13: p. 15]). This fact indicates the underdeveloped ability of managers of commercial organizations to adjust to their occupation, and the necessity of updating higher education to be aimed at formation of not only certain competences but also the ability of permanent upgrading and transformation of these competences according to the business environment. The given disparity determines the rationale for development and theoretical justification of new educational conditions, ensuring effective occupational adjustment of managers of commercial organizations in higher educational establishments. - management (A.A. Gorodnova , E.N. Kobtseva , M.A. Lukashenko , E.R. Safarlagiev ). In spite of a large number of researches and publications in this field, there is a need for identification and theoretical justification of new educational conditions, ensuring effective occupational adjustment of managers of commercial organizations in higher educational establishments. To meet the abovementioned need it is necessary to: single out professional competences of managers of commercial organizations as well as additional abilities and personality qualities, needed for successful occupational adjustment, but not acquired while getting a degree; develop and justify corresponding educational conditions that will contribute to occupational adjustment of managers of commercial organizations. The aim of the article is to offer theoretical justification of effectiveness of developed educational conditions in ensuring effective occupational adjustment of managers of commercial organizations in higher educational establishments on the basis of study of scientific publications in psychology, pedagogy and management. The job description of a manager of a commercial organization, as well as a representative of any other occupation, consists of certain tasks that he or she has to accomplish. To carry out the responsibilities successfully, a manager should be armed with corresponding competences, the amount of which equals the number of professional tasks. In the western theory of human resources management competence is defined as a combination of the acquired professional knowledge and skills, necessary for fulfilling job requirements (key acquired competences) and personal qualities and abilities which are naturally present in the individual (key natural competencies). It will be reasonable to use this approach in identification of the competences of managers of commercial organizations. As the main task of a commercial organization is to satisfy a client, an important constituent of manager’s work is co-operation with people on different levels, and not infrequently his behavior plays a decisive role. Having studied the graphic representation of competences of a manger compiled by A.A. Gorodnova , we can highlight the importance of competences at the skills and behavior levels (Picture 1). Pic. 1. Competences of a manager [4: p. 110]. The conditions of modern business are so unstable, that the tasks of a manager of a commercial organization change and transform themselves all the time and he or she has to adapt to the new work environment. Thus the need for new competences arises, i.e., the aspect of occupational adaptation comes into the picture. Occupational adaptation is the perfection of professional capabilities by mastering additional knowledge and skills, developing personality qualities, crucial for one’s occupation, as well as positive attitude towards one’s work (E.N. Kobtseva [7: p. 101]). 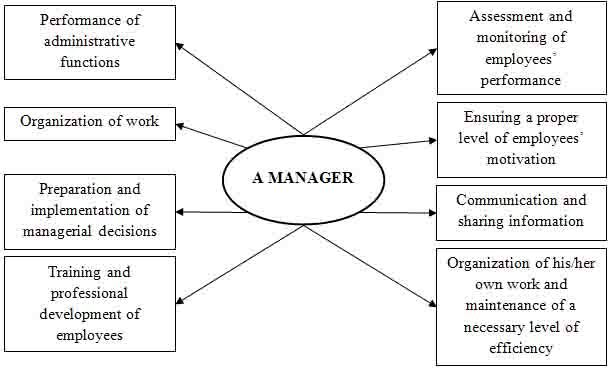 One of the tasks of this article is to determine professional competences of managers of commercial organizations in combination with additional abilities and personality qualities that are needed for successful occupational adjustment, but are neglected in the training of qualified specialists. M.A. Lukashenko  takes notice of the fact, that the market of educational services is flooded by educational and training institutions, which make up for the blanks in education, received in a higher educational establishment. In the field of management they conduct training, related both to the specific character of profession as well as development of so-called «soft skills» or «life skills». «Soft skills» are related to people’s co-operation, i.e. «soft» (or «social») skills are needed both for everyday life and for work in an equal degree. This type of skills is contrasted with another one – «hard skills» – professional and technical skills, which can be easily monitored, measured and demonstrated . The age-related analysis of the participants of training workshops of such kind shows that they are attended mostly by young managers who have recently graduated from higher educational establishments. These facts prove that nowadays graduate students, having a sufficient theoretical basis, lack the knowledge and skills, directly related to the specific character of managerial work, and also demonstrate a low level of soft skills development. Both of these factors negatively impact their professional adjustment . The existence of given disparities determine the rationale for development and theoretical justification of new educational conditions, ensuring effective occupational adjustment of managers of commercial organizations in higher educational establishments. 2. Direction of education at adoption of norms, values, patterns of behavior, acquisition of necessary social-professional qualities of managers of commercial organizations by including the corresponding content modules to the cycle of the profession-oriented disciplines and internships. 3. Carrying out training on the basis of professional communication. 4. Organization of training process on the basis of interactive methods of learning. 5. Combining theory with practical organization of commerce. Now we will analyze how effectively these educational conditions improve occupational adjustment of future managers of commercial organizations. While theoretically justifying these educational conditions we will take into account the cultivation of underdeveloped key competences and criteria of managers’ occupational adjustment in a higher educational establishment. - ability to find non-standard, non-trivial decisions. - social-psychological criterion (the characteristic is «emotional and psychological stability») [18: p. 10]. Having entered higher educational establishment, former schoolchildren face a problem that psychology defines as an «adaptation syndrome» of a first-year university student – the necessity of adaptation to the new kind of activity and its pace. In addition, majority of them are in the middle of a complicated process of determining their place in society and forming their own identity. The problem of self-determination of teenagers was extensively studied in the works by D.I. Fildshtein. He came to the conclusion, that during this period teenagers are the most sensible to mastering socially meaningful values and forming social competences. Taking into account the abovementioned psychological peculiarities, the tasks of a higher educational establishment on this stage is to facilitate overcoming of «adaptation syndrome», develop adaptive potential of a personality, and found the basis of social and occupational adaptation of future managers. N.N. Melnikova , analyzing and classifying the adaptive qualities distinguished by different researchers, talks about existence of the most universal qualities, ensuring an optimal process of adaptation. They are tolerance, sociability, openness to new experience, empathy, flexibility of thinking and behavior. We will refer to these qualities as an adaptive potential of a personality, that contributes to occupational adjustment. If to examine the content component of higher education, development of these qualities is ensured by introduction to the curriculum of humanitarian and socio-economic disciplines which perform values-orienting and aesthetic functions. Occupational adjustment in this period is fulfilled by introducing students to the profession of a manager, studying basics of major disciplines and determining their value in the future profession, conducting objective estimation of their abilities and preparedness to the future profession, selection of prospects of development and self-perfection. It is crucial for achievement of these aims to include a course «Introduction to professional activity» to the curriculum of the first-year students. The task of this course is not only to inform young people about the necessary knowledge and skills, but help them to identify a place of a manager in a society (I.F. Kartashevskaya ). As for the approaches to an educational process, providing personality-oriented education reflects the above-mentioned aims of a higher educational establishment. Personality-oriented education is viewed as an alternative to traditional cognitive-oriented one. It is defined as a new special type of education, based on cooperation of students and teachers, and thus creating optimal conditions for development of students’ capacity for a self-education, self-determination, and self-actualization. The student’s personality is considered to be the core of this system of education. (S.Y. Batyshev [11: p. 129]). - assistance in professional self-determination and self-actualization. These tasks coincide with the tasks of a higher educational establishment - personality development at all levels, stressing cultivation of personality qualities, important for managerial profession, and necessary for development of adaptive potential and successful occupational adjustment in the future. However, the personality-oriented approach is effective not only at the initial stages of the professional training of managers. In accordance with the requirements of the Bologna declaration the system of modules and credits is accepted in all higher educational establishments of Ukraine. It increases the volume of independent work of a student to 50-60 %. Within the framework of this system cooperation of a teacher and a student takes place on a fundamentally new basis: with the help of modules students consciously and independently reach a certain level of preliminary preparedness (V.L. Оrtinskii [12: p. 101]). Such organization of educational process in higher educational establishments is a technique of a personality-oriented professional training stressing self-education and aiming at cultivation of cognitive abilities of students. The personality-oriented approach to education presupposes the use of interactive methods of learning. Depending on the level of cognitive activity, the passive and active methods of instruction are distinguished (S.B. Stupina ). When employing active (hands-on) training (unlike passive one) a student is the subject (not an object) of educational instruction. He or she does not simply memorize and reproduce material, but actively participates in a cognitive process, completing creative, problem-solving tasks and the ones requiring searching for new material [19: p. 15]. One of the modern directions of hands-on training is the interactive learning. Within interactive learning the organization of instruction process differs from the ordinary one: it proceeds not from theory to practice, but from forming of new experience to its theoretical comprehension through action (S.B. Stupina [19: p. 17]). This method was initially intended for training managers, as the concept of action learning was offered by Mike Pedler in the article «Creating effective managers» in 1971. - training-related: forms of training (like training sessions aimed at developing communicative skills, needed for group–work) that can combine discussion-related and game related methods of learning [19: p. 19]. G.V. Bezyuleva [2: p. 111] describes three lines of development of skills through hands-on training: personality-related skills (important for individual in the sphere of interaction with others); group-work skills (related to the necessity to live and work in a group) and managerial skills (related to self-management of a life of an individual) (Table 1.). In fact, the table distinguishes 3 groups of soft skills, necessary for successful occupational adjustment of managers of commercial organizations. A.P. Panfilova  analyzing the rationale for usage of interactive learning in training future managers, talks about its efficiency in developing not only basic skills, but also so called «meta-skills». They allow the individuals and organizations to manage jointly their basic skills if any contingency arises. Meta-skills, as a rule, are not related to professional qualifications, but they allow those, who have mastered them, to adapt their present knowledge to the new circumstances, aims and tasks. - emotional predisposition to work under changing conditions [13: p. 14]. Acquiring the necessary social and professional qualities by future managers of commercial organizations occurs due to revision of profession-oriented disciplines in the curriculum. One of the gurus of management, Henry Mintzberg draws attention to the overload of curriculum with the subjects forming hard skills, among which he names Finances, Accounting, Marketing, Mathematical Modeling, Statistics, Economic and Investment Analysis, Marketing Planning, Financial Management. Such a heavy accent on «hard-disciplines» practically does not leave a place to the subjects, developing soft skills, which are crucial for a manager, – leadership, group-work, communication skills and non-standard way of thinking. The results of the studies conducted by Harvard University and Stanford Research Institute show that the contribution of hard skills to professional success of a manager makes only 15%, whereas soft skills determine the remaining 85%. Thus, to ensure the effectiveness of occupational adjustment of managers of commercial organizations it is necessary to balance the curriculum by reducing the amount of academic hours of hard-disciplines, maintaining the subjects developing both types of skills (e.g., Human Resources Management) and introducing soft-disciplines – Team-Building, The Art of Presentation, Leadership, etc . The effective measure of improvement of occupational adjustment of future managers of commercial organizations is organization of professional training on the basis of professional communication. A communicative competence of a manager is a practical side of business relationships. It is reasonable to develop the communicative competence of managers in the mother tongue and in the English language as well as their computer skills. Preparedness to professional communication with specialists. Its further usage in making professional decisions. Organizing and conducting business meetings, participating in conferences. Delivering presentations and chairing conferences. Ability to negotiate with foreign partners. Development of friendly relationships with colleagues. Creation of positive moral climate in the company. Using basic and profession-related computer programs. Collection, analysis and classification of information. In addition to a new organization of educational process it is necessary to provide a connection of gained knowledge and skills with their practical employment. It is done with the help of internships. - diagnostic function (examination of professional orientation levels of future specialists, levels of professional aptitude and preparedness to professional activity). At the stage of training professional adjustment starts in the form of individual’s adaptation to the profession, the clarification of the professional challenges takes place, acceptance of a role of a professional is beginning. At the stage of internship the adaptation intensifies, professional motives and aims are being corrected, aspirations for mastering high standards and patterns of professionalism are gaining strength, the first feeling of labour satisfaction appears, the reasons for self-actualization of personality with the help of labour arise, the number of motives in a motivational sphere increases, their hierarchy becomes complicated (E.R. Safarlagiev ). Thus, internships can be viewed as the intermediate monitoring stages of occupational adjustment of managers in a higher educational establishment, when, facing the real work conditions, a student fully applies the acquired knowledge, skills and capabilities, detects certain disparities that he or she has to work on during the further study. Pre-graduation internship is a finishing stage of occupational adjustment of a manager of a commercial organization in a higher educational establishment. The educational conditions, described in this article, correspond to the four criteria of preparedness for occupational adjustment of future managers. In this article the theoretical justification of effectiveness of educational conditions of occupational adjustment of managers of commercial organizations in a higher educational establishment was presented. The theoretical justification was based on the identified key competences of managers of commercial organizations as well as additional qualities, insufficiently developed by higher education. It also took into account those aspects of occupational adjustment which are neglected by a higher educational establishment. Analyzing the educational conditions (personality-oriented education, formation of social-professional qualities of managers by the correction of a content component of education and professional communication, association of theory with practice of organization of commerce), we came to the following conclusion: when combined, the abovementioned educational conditions reach synergy in the improvement of social and professional self-determination of students as well as their important professional qualities. It has a positive impact on their occupational adjustment. Moreover, such kind of education develops meta-skills necessary for adjustment of present competences and personality qualities of a manager to the changing environment. 1. Abdykarimov, B.A., Abdyrov, A.M., Baubekova, G.D. (2009), “Professional Education: a Handbook” [Professionalnaya pedagogіka: uchebnoe posobie], Astana, S.Seifullin Kazakh Agro Technical University Press, 309 p.
3. General and Occupational Psychology, a handbook for students of teachers training institutions, edited by V.D. Symonenko [Obschaya i professionalnaya pedagogika, ucheb. posobie dlya stud. ped. vuzov, pod red. V.D. Symonenka], Moscow, Ventana-Graf, 2006, 368 p.
5. Hard or Soft Skills: What is More Important for a Manager? [Hard ili soft skills: chto vazhnee dlya menedzhera? ], available at http://futurecenter.in.ua/pratsevlashtuvannya/korysni-porady/hard-yly-soft-skills-chto-vazhnee-dlya-menedzhera. 6. Kartashevskaya, I.F., Ostrouhova, L.V., Dihtyar, A.I. (2001), “The Concept of a Step-by-Step Development of a Professional Manager” [Kontseptsiya poetapnogo formirovaniya spetsialista-menedzhera], Kultura narodov Prichernomorya, №18, p. 19-55. 7. Kobtseva, E.N. (2008), “Adaptation of Employees: Classification and Characteristics” [Adaptatsiya personala: klassifikatsiya vidov i pokazateli], Vestnik VGU, №1, p. 100-104. 8. Kovalenko, O.E. (2005), “Methodology of Occupational Education” a Textbook for Higher Educational Establishments [Metodyka profesiinoho navchannia, pidruchnyk dlia stud. vyschykh navch. zakladiv], Kharkiv, “People’s Ukrainian Academy” Press, 360 p.
9. Lukashenko, M.A. “Professional Competencies of a Manager” [Professionalnyie kompetentsii rukovoditelya], Korporativnyi menedzhment, available at http://www.cfin.ru/management/strategy/competit/ksao.shtml. 11. Occupational Pedagogy, a handbook for students of higher educational establishments, edited by S.Ya. Batyshev, A.M. Novikov [Professionalnaya pedagogika, Uchebnik dlya studentov, obuchayushchikhsya po pedagogicheskim spetsial'nostyam i napravleniyam, pod red. S.Ya. Batyshev, A.M. Novikov], Moscow, EGVERS, 2009, 457 p.
12. Ortinskiy, V.L. (2009), ‘Pedagogy of Higher Education”, a handbook for students of higher educational establishments [Pedagogika vyschoii schkoly, navch. posib. dlya stud. visch. navch. Zakl], Kyiv, Tsentr uchbovoii literatury, 472 p.
13. Panfilova, A.P. (2009), “Innovative Teaching Techniques: Active Learning”, a handbook for students of higher educational establishments [Innovatsionnyie pedagogicheskie tehnologii: Aktivnoe obuchenie, ucheb. posobie dlya stud. vyissh. ucheb. zavedeniy], Moscow, “Akademia” publishing house, 192 p.
14. Pedagogy of Higher Education, a handbook for students of higher educational establishments edited by V. G. Kremin [Pedahohika vischoii shkoly, pidruchnik dlya stud. vischikh navch. zakladiv za. red. V. G. Kremenya], Kyiv, Pedahohichna dumka, 2008, 256 p.
16. Rudnitska, K.V. (2013), “Comparative Analysis of Efficiency of Pedagogical Conditions of Forming Professional Language Competence of Future Specialists of Economic Direction” [Porivnialnyi analiz efektyvnosti pedagogichnyh umov formuvannia profesiynoii movnoii kompetentnosti maibutnikh fakhivtsiv ekonomichnogo profiliu], Pedagogichni nauky, #2 (67), p. 220-229. 17. Safarlagiev, E.R. (2012), “Expansion of Professional Activity of a Manager as a Basis of Introduction of Additional Areas” [Rasshirenie professionalnoy deyatelnosti menedzhera kak osnova vvedeniya dopolnitelnyih napravleniy], Contemporary studies of social problems (online journal) [Sovremennye issledovaniya sotsialnykh problem (elektronnyi nauchnyi zhurnal], #1 (09), available at http://sisp.nkras.ru/p-ru/issues/2012/1.pdf. 18. Severova, L.A. (2012), “Pedagogical Conditions of Occupational Adjustment of Future Managers of Social-Cultural Direction in Higher Educational Establishments of Culture and Arts”, author's summary of Ph.D. dissertation in Pedagogy [Pedagogicheskie usloviya professionalnoy adaptatsii k prakticheskoy rabote buduschikh menedzherov sotsialno-kulturnoy deyatelnosti v vuzah kultury i iskusstv, avtoref. dis. kand. ped. nauk], Moscow, Moscow State Art and Cultural University Press, 23 p.
19. Stupina, S.B. (2009), “Techniques of Interactive Learning In a Higher Educational Establishment, a Handbook [Tehnologii interaktivnogo obucheniya v vyisshey shkole, uchebno-metodicheskoe posobie], Saratov, «Nauka» publishing house, 52 p.
20. Winfield P., Bishop R., Porter K. (2004), Core Management for HR Students and Practitioners, Oxford, 577 p.
Поступила в редакцию 02.06.2014 г.